It is a fanboy’s perfect fantasy: set between the two best Star Wars movies, A New Hope and The Empire Strikes Back, our heroes – who all look like the original cast from way back then - continue their campaign against the Empire in the wake of successfully blowing up the Death Star. Han Solo leads a covert rebel strike force against the Empire’s biggest weapons factory on Cymoon-1. But things don’t go as planned, especially once the Empire’s “negotiator” appears. 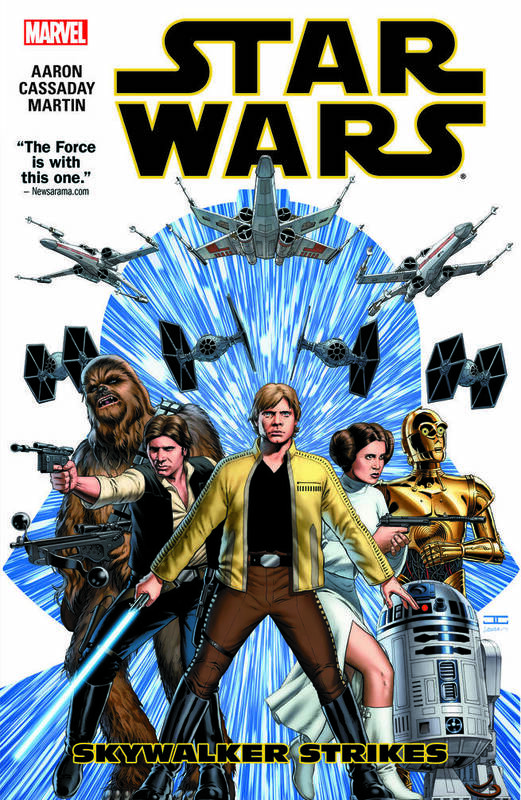 Jason Aaron and John Cassaday’s Star Wars is a very good comic and a promising start to Marvel’s new Star Wars line but I don’t think the quality is what made its first issue the biggest-selling single issue in 20 years; the hysteria following that first Star Wars teaser from JJ Abrams’ forthcoming Star Wars movie, The Force Awakens, probably had a lot to do with rekindling peoples’ love of the franchise (not to mention that second teaser – they’re home!!!). That said, the first three issues of this arc are truly outstanding. The rebel attack on Cymoon-1 is expertly choreographed by Aaron who splits up the action between three groups: Chewie, Threepio and the Falcon; Han, Leia and Artoo causing havoc inside the weapons factory; and Luke and Vader dueling. Aaron jumps from one group to the next in perfectly measured doses. The action is exciting and the story fast-moving and completely engrossing. Couple that with Cassaday’s gorgeous art that recalls the glory of those original movies, aided by Laura Martin’s beautiful colors, and it’s the best possible start the series could’ve had. Then the second half of the book starts and… it’s a bit meandering. Aaron’s tightly-knit first half is gone, replaced with characters basically treading water. Han and Leia go looking for a new rebel base, which we know will be Hoth; Luke and Artoo vaguely look for something to help with his Jedi training; Vader stands around looking menacing, wondering who the kid really is (he and Luke haven’t had the “I am your father scene” yet) – it’s underwhelming stuff following on the heels of that blistering opener. Star Wars icon Jabba the Hutt has a cameo and fan favorite Boba Fett plays a large role in the second half of the narrative, both of which helps waylay the increasingly slow-moving, er, “story”. Then it ends on a big soap-opera-esque reveal that’s currently generating lots of spoiler-filled articles on comics sites (and isn’t that great a surprise anyway). Aaron has the voices of the characters down cold, particularly Han whom he writes with a flourish, while Cassaday’s art faithfully replicates the look and feel of those original movies (even if he is a bit too enamored of the Dutch angle). Besides the second half’s plotting, I have no complaints about the writing or the art – these two are a great match. In terms of the extended universe that was built up over at Dark Horse, I don’t think Marvel have kept any of it - it’s all gone and they’re starting anew. Not so good for fans of all that stuff, good for new readers jumping on board and only have experience of the movies. 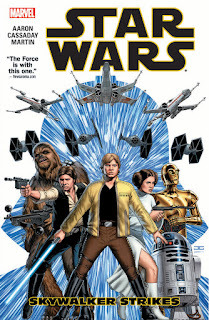 I’m not a fan of Star Wars comics (I’ve read only one other Star Wars book before this) and I had a blast – I imagine bigger fans of the franchise will gobble this up! Star Wars: Skywalker Strikes is a fine first volume from two creators at the top of their game, and perfectly timed by Disney to take advantage of the keen anticipation for The Force Awakens this Christmas. It’s half a superb book but the other half still has plenty of cool moments to keep readers interested. A grand space-operatic fun read! Here’s hoping you-know-who doesn’t ruin this comic by ever feeling the urge to do a special edition of it!